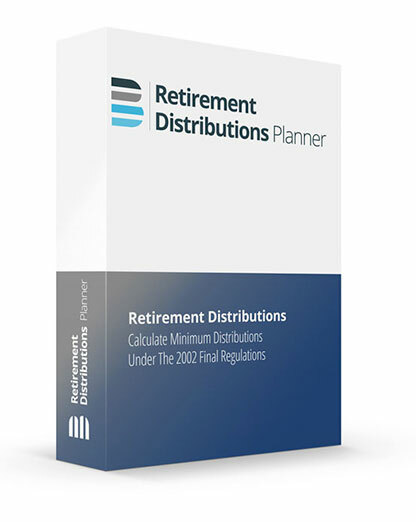 The Retirement Plan Analyzer evaluates various strategies of taking distributions from traditional IRAs, Roth IRAs, Roth 401(k)s and other qualified retirement plans. One of the most desired features of the Retirement Plan Analyzer is the Roth IRA conversion feature, used for comparing and evaluating conversions to a Roth IRA. Roth IRA conversions in any one or multiple years may be modeled. This is Brentmark’s most comprehensive retirement program. Fact finder had been updated. User interface has been updated. AFR and Help files are now on-line. New install software has been added. 2019 Income and Estate Tax adjustments have been added. The State Death Tax Manager has been updated to include changes for CT, DC, HI, ME, RI, NY & VT.
Retirement Plan Analyzer is priced at $595 for a single initial license, including six months of coverage (updates sent as released based on tax law changes). Future annual renewal coverage is $179 for a single license.